What are the best Strollers for Twins? Having twin children can be a handful because they can easily get all over the place, especially if you’re dealing with both of them on your own. Taking care and raising one child is already a challenge, how much more two? When taking them out, parents should be creative and resourceful as to be able to tote them and all their stuff around without straining too much. This is why there are double strollers that would make it easier for you to take them wherever. You won’t have to carry or hold them all the time and they’re also more secure as the stroller prevents them from wandering about. 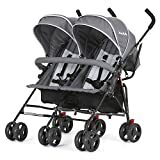 If this is the first time you tried to search for the best strollers for twins, we have listed some that are definitely worth checking. 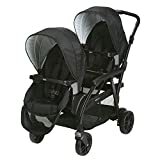 What are the recommended strollers for twins? The Graco DuoGlider is a stroller that comes in stadium-style so one child is in front of the other. This is great if you want to be able to squeeze through crowds without bumping on anyone or anything. It is as narrow as traditional single strollers and is considerably easier to navigate. The stroller can hold two children of up to 40 pounds. The seats can be reclined so your child can take a nap whenever. Individual canopies, foot rest, and molded kiddie tray are installed so your kids will feel very comfortable. The stroller can be folded with just one hand and can be carried, but it is slightly heavy. There is an extra large storage basket with easy access and parent’s tray with cup holders installed in the stroller for added convenience. 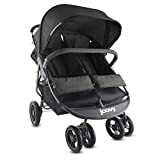 For the price, this is really a good deal considering how solid the entire stroller feels. This stroller has aluminum frame, which makes it light yet sturdy. This is great for parents who would like to keep in shape and take their kids out for a run. The front wheels can be locked manually so that it doesn’t wobble and instead go on a straight line all the time. The two seats are padded and covered by an adjustable canopy so your kids are protected from the sunlight and harmful UV. There are double flip open child trays with dual cup holders and molded parent tray with double cup holders as well. For the parent’s entertainment, this stroller comes with canopy-mounted speakers that accept most MP3 players. This double stroller lets your twin sit back-to-back. This is good if they’re bigger or toddlers that can’t be accommodated by a stadium-style stroller. This way, you still get the perks of being able to go through narrow passageways or go into a large crowd without bumping anyone. 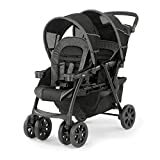 This stroller enables multiple position reclining seats, five point harness that prevents your kids from standing up and child trays with cup holders. The only downside is that the seat at the back doesn’t come with a canopy, and is intended for an older child. However, the back-to-back idea is great and doable for twins. The bottom part serves as a basket for the needs of your children, but is not big enough for a day’s worth of stuff. side-by-side stroller is one of the best for twin kids because of the size, comfort, and maneuverability. Each seat can accommodate up to 45 pounds and can recline for when your kids need to nap. The seats come with harnesses to prevent your child from standing up. There are no trays for the kids but there are removable bumper bars they can hold onto as well as canopies. The wheels have sealed bearings, which make it a breeze to push especially on rough terrains. There is no parent tray but behind the seats there are two cup holders, two zippered pockets for small items like phones and wallets, and a large basket that can fit all your children’s essentials. This side-by-side stroller is best for twins because the seats are truly identical in design, shape, and size. The seats can be positioned in many ways, including a reclined position and it has an adjustable leg support and canopy. Underneath the seats you can find dual front and back wheels with suspension and locking swivels for additional safety. There’s also a mesh bag that can be used to store your children’s needs, although it is relatively small and can only fit so much. 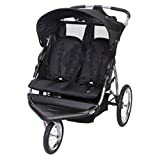 This double stroller is great for travel because it is very compact when folded and can be carried for easy travel and storage. The Combi Twin Cosmo Stroller is versatile in the sense that it is compact and also can maintain a self-standing fold. There is multiple padding and multi-position of the seats so that they recline, whilst also containing a convertible three-or five-point harness. Additionally there is a storage basket and canopy pockets for additional space. This stroller has the added benefit of narrowness, a trait that is not always present with double strollers. The belly bar is also soft and flexible, offering an excellent amount of safety and support. Additionally, customers love the fact that it folds standing up, making it very easy to pack up and store in a small vehicle or small space when unused. On the downside however are the wheels, which seem to be a little troublesome at times and unguided. Additionally the stroller will only fit with a Combi car seat, meaning you will have to purchase the same style car seat. On top of this locking system is a little bit fiddly to manage and could easily be damaged if not used correctly. 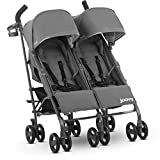 Overall there are a good number of twin strollers available that have the capacity to be used for multiple occasions as well as coupled with some very useful car seats. Safety is always the most important aspect to consider remembering to ensure that first before making your decision and you should easily find the best twin stroller.